Terroirist: A Daily Wine Blog » 2015 Bordeaux Futures: Worth Buying? Now that you understand how I generally analyze a futures offering, let’s look at the 2015 futures campaign to see if it passes muster. In applying my relative value test (i.e., question #3), I chose to examine a broad cross-section of wines from all of the major Bordeaux regions. This group includes both classified and non-classified wines. I also elected to use the 2012 vintage as the most recent comparative in-bottle vintage. I chose this vintage over 2009 or 2010 because I feel that, although 2015 is definitely a superior vintage to 2012, the variable quality of the 2015 vintage makes it more closely aligned with that of 2012. In fact, if you look at the wine scores in the chart below you will see that for many wines their 2012 and 2015 scores are fairly similar. Moreover, the older age, significantly better quality and high initial release price of the 2009 and 2010 vintages make them a poor relative value benchmark. *All wine scores are from The Wine Advocate. NR means Not Rated. **All prices represent the lowest per bottle price listed by a reputable wine merchant on Wine-Searcher.com. As the above chart shows, the average price per bottle for the 2015 futures vintage represents a 12% premium to that of the average current price for the 2012 in-bottle vintage. This price premium suggests that the 2015 futures campaign is generally over-priced. Actually, this analysis is a bit simplistic in that not all of the wines offered in the 2015 futures campaign represent a poor value. 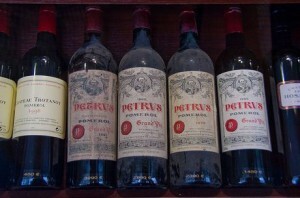 Rather, several wines are priced at a significant discount to their 2012 counterparts. However, most of these wines are conservatively priced because they were released early in the futures campaign. See Pape Clement, Gazin, Hosanna, Batailly, Dauzac, Bellevue and La Gaffaliere. As the campaign proceeded, and it became clear that the first wines were well received, the trend was for each successive new release to come out at a higher price. The end result being that, as a whole, the 2015 futures campaign is not one to get excited about – at least from a comparative value standpoint. For my money, I would rather cherry pick a few of the highly rated and fairly priced 2012s and look to buy a select few of the best 2014s when they are released in-bottle this fall. If, however, you want an allocation of the 2015s, I would wait until they are released in-bottle since the majority of these wines likely will be selling at or close to their current futures price. Mark E. Ricardo is a contributing writer for the Terroirst Wine Blog, the author of Simply Burgundy: “A Practical Guide to Understanding the Wines of Burgundy” and the founder of Trellis Fine Wine Investments, LLC, a boutique fine wine advisory firm. He also is the former wine and food columnist for the Washington Theater Review and an avid collector of fine wine. In addition to his wine related endeavors, Mark is a practicing attorney.